426 Marlborough is located on the south side of Marlborough, between Massachusetts Avenue and Charlesgate East, with 424 Marlborough to the east and 428 Marlborough to the west. 426 Marlborough was designed by architect Obed F. Smith and build in 1887 by Charles A. Dodge, mason, for building contractor George Wheatland, Jr., for speculative sale. George Wheatland is shown as the owner on the original building permit, dated February 26, 1887. George Wheatland, Jr., purchased the land for 426 Marlborough on June 7, 1886, from Henry Lee, H. Hollis Hunnewell, and Augustus Lowell. It was part of a larger parcel that Henry Lee and his partners purchased on February 20, 1883, from a real estate investment trust formed by Grenville T. W. Braman, Henry D. Hyde, and Frank W. Andrews. The parcel was one several tracts of land the trust had purchased from the Boston Water Power Company on March 1, 1872. Click here for an index to the deeds for 426 Marlborough, and click here for further information on the land west of Massachusetts Avenue between the south side of Beacon and the north side of Commonwealth. On December 12, 1887, 426 Marlborough was purchased from George Wheatland, Jr., by Lucy (Pearson) Irwin, the wife of John A. Irwin. They previously had lived at the Hotel Palmerston at 177 West Chester Park (406 Massachusetts Avenue). They also maintained a home in Duxbury. John Irwin had been a tea, coffee, and spice merchant in the mid-1880s and by 1888 was a cigar manufacturer. By 1890, he was president of a lumber company. The Irwins continued to live at 426 Marlborough during the 1889-1890 winter season, but moved to Duxbury thereafter. On August 29, 1890, 426 Marlborough was purchased from Lucy Irwin by Philip G. Morrison, a banker. He and his wife, Helen C. (Dinsmore) Morrison, made it their home. They previously had lived at 6 Garrison. They continued to live at 426 Marlborough during the 1891-1892 winter season, after which they traveled to Europe. On May 3, 1892, 426 Marlborough was acquired from Philip Morrison by his brother, Barnabas Thacher Morrison, and on June 1, 1892, it was acquired from him by Edward Dehon Blake, a marine and fire insurance agent. He and his wife, Annie A. (Chase) Blake, made it their home. They previously had lived at 29 West Cedar. On September 14, 1894, Edward Blake transferred the property into his wife’s name. Edward Blake died in March of 1928 and Annie Blake died in April of 1928. 426 Marlborough was inherited by their son, Francis Minot Blake. On May 14, 1929, 426 Marlborough was acquired from Francis Blake by Dr. Marcellus Reeves, a physician and surgeon. He and his wife, Irma (Fischer/Fisher) Reeves, made it their home and he maintained his office there. They previously had lived in Cambridge. On July 11, 1929, he transferred the property into his wife’s name. On January 29, 1937, Francis Blake foreclosed on a mortgage given by Marcellus Reeves when he purchased 426 Marlborough and took possession of the property. On March 11, 1937, Marcellus and Irma Reeves re-acquired it from Francis Blake. 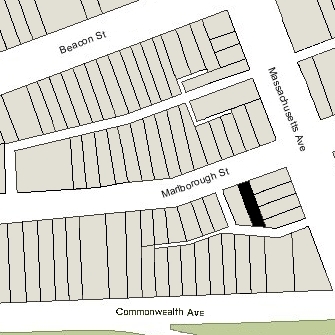 Marcellus and Irma Reeves continued to live at 426 Marlborough until 1943, when they moved to 1200 Commonwealth in Allston, where they were living at the time of his death in October of 1944. On March 1, 1943, 426 Marlborough was acquired from the Reeveses by Irving James Kennedy and his wife, Louise (McNeil) Kennedy. They previously had lived at 24 Haviland. He was an advertising company salesman and later a real estate agent. In April of 1948, Irving Kennedy filed for (and subsequently received) permission to convert the house into six apartments. 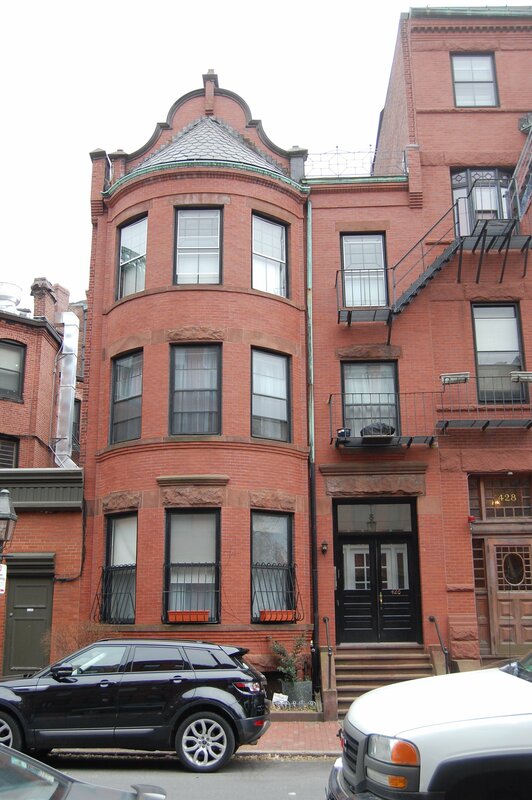 The Kennedys continued to live in one of the apartments at 426 Marlborough until the early 1960s. On November 16, 1962, 426 Marlborough was purchased from the Kennedys by Russell Amaral, trustee of the Russell Realty Trust. In February of 1964, he applied for (and subsequent received) permission to remodel the interior. It remained a six unit apartment building. On March 6, 1964, he transferred the property to himself as trustee of the Sudan Realty Trust. On December 13, 1965, 426 Marlborough was acquired from Russell Amaral by Miss Mary Angela Cocuzzo and Miss Nancy A. Casey. Mary Cocuzzo lived in Brighton and was employed by the Mazzola Market in Brighton. Nancy Casey lived in Belmont and was an employee of the National Shawmut Bank. 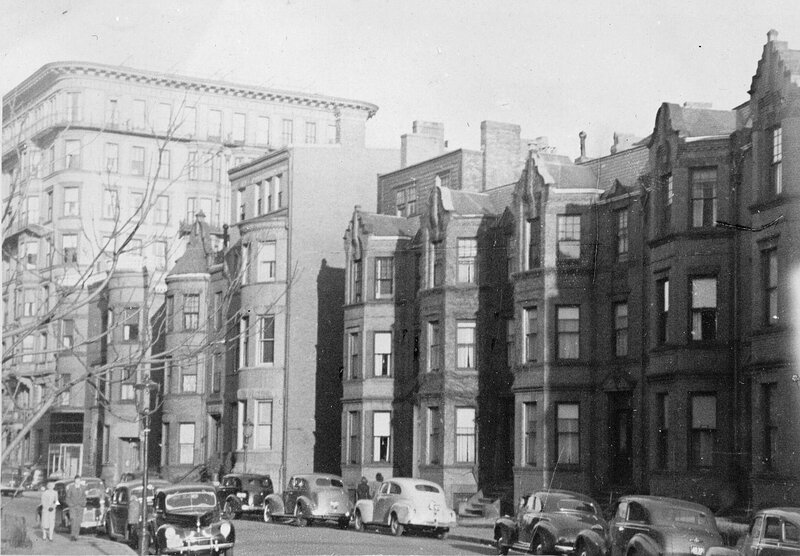 From the mid-1960s, they owned several apartment buildings and lodging houses in the Back Bay. On February 20, 1968, 426 Marlborough was acquired from Mary Cocuzzo and Nancy Casey by Francis Gerardo Mazzola, trustee of the Gerardo A. Trust. Mary Cocuzzo and Francis Mazzola were first cousins, sharing the same maternal grandparents (Mary Cocuzzo was the daughter of Domenic Cocuzzo and Angela (Deluca) Cocuzzo, and Francis Mazzola was the son of Gerardo Antonio Mazzola and Maria (DeLuca) Mazzola). On April 8, 1969, 426 Marlborough was acquired from Francis Mazzola by Daniel R. Schurz. On November 6, 1970, Edward J. Hall and Robert G. Pettitt each acquired a one-third undivided interest in 426 Marlborough from Daniel Schurz. On October 12, 1972, they acquired Daniel Schurz’s interest, and on January 25, 1990, Robert Pettit acquired Edward Hall’s interest. On December 1, 2016, 426 Marlborough was purchased from Robert Pettit by Rafla Properties LLC (Mark Rosen, manager) and S&D Boston Properties LLC (Abram Rafla and Marta Rafla, managers). 426 Marlborough remained a six unit apartment building in 2018.